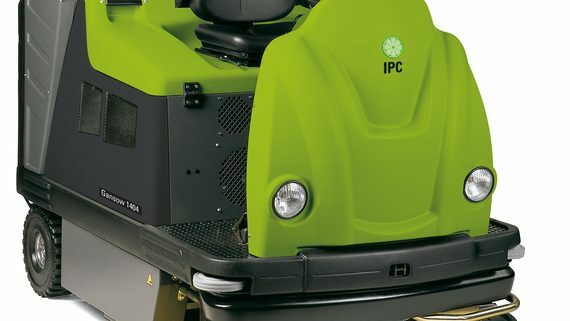 The IPC Gansow 191 ride on sweeper is the largest model in the range and is a true work horse. With a massive 500 litre front loading waste container, maximum sweeping with of 2.2 meters and a productivity of 15,750m²/h. If you have a large warehouse, car park of factory that needs sweeping in the shortest possible time then the 191 is the right choice. With the option of 1, 2 or 3 side brushes, and various cab options to suit all working conditions and budgets. The third optional side brush is operated from the control panel and moves into hard to reach areas and pavements. Fully hydraulic steering from the rear wheel makes turning in tight spaces possible while the automatic hopper lift makes emptying even easier. With a climb angle of 16% the 191 is also the perfect choice for leisure centres that need to clean outside as well as in car parks. Flashing beacon and lights also allow working at night. The video below shows the IPC Gansow 161 which is the smaller version of the 191. The IPC Gansow 1404 ride on sweeper is one of the larger rear loading models in the range. With a large 150 litre waste container with an automatic rear lifting hopper that empties at the push of a button (see video). The 80cm main brush collects all debris from general waste to stones and leaf litter. The fine dust that is created during the sweeping process is then filtered through the large 6m² panel filter with automatic filter shaker to leave a dust free environment. The No Dust in Curve (NDC) system moves the side brushes when turning to collect all the dirt that is left with most other machines reducing the number of passes. The Self Levelling System (SLS) ensures constant brush pressure even in rougher surfaces. 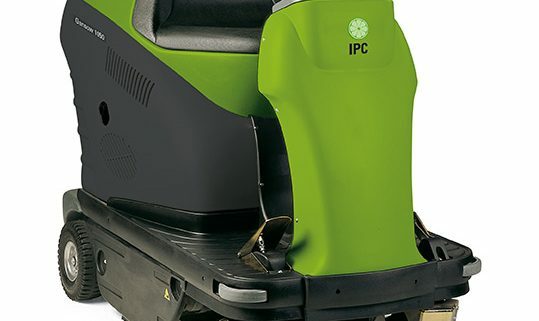 The IPC Gansow 1250 ride on sweeper is the latest upgrade to the sweeper range from IPC Gansow. Available in four model specifications battery; dual power (battery & petrol engine); petrol and diesel. This allows use in virtually all environments depending on the users requirements. Featuring a 1.2M sweeping width with twin side brushes for edge cleaning and 85L slide out waste hopper. The twin side brushes are speed controlled allowing the operator to adjust the speed according to the dirt level. For dusty environments the 1250 sweeper has a powerful vacuum to filter the dust and has an automatic filter cleaning system to maintain the suction. On uneven floors the 1250 brush automatically adjusts to keep constant pressure collecting all debris in its path, while the side brushes are spring loaded to protect from side impacts. With the high forward seat position the operator has a full 360 degree view to protect the machine and obstacles from damage. Lease purchase and contract hire options from £42.63 per week are available on the IPC Gansow 1250 sweeper. Call us to discuss your requirements. The IPC Gansow 1010 ride on sweeper fills the gap between the larger walk-behind sweepers and the more industrial machines. Designed for use indoors and out on smoother floors in factories, warehouses, car parks etc. Designed to be simple in use with a pull out waste tray, ergonomic control panel and great forward visibility. The IPC Gansow 1010 can clean up to 7,700m²/h and with the large filter panel collecting all the fine dust you will leave the area clean and not in a cloud of dust. Available in both battery and petrol versions. Complete with 1 year warranty. The 1050 is the perfect step up to higher productivity from walk behind units. Small enough to go through a 32″ opening but large enough to clean a 42″ cleaning path. The IPC Gansow CT230 BT105 features the largest tank size within the range giving maximum runtime between re-fills. With 3 pre-programmed work settings the CT230 is ready to clean at the touch of a button. Even though the CT230 is the largest ride-on, it’s still incredibly easy to drive and turns on the spot giving increased flexibility in tighter spaces. The driver has the best visibility thanks to the streamline control panel, reducing damage to both obstacles and machine. 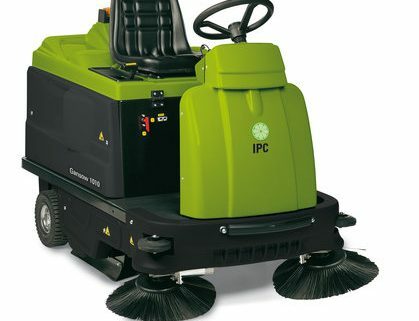 The IPC Gansow CT230 BT105 can clean up to 7,500m²/h leaving the floor clean and dry. Leaving the floor dry increases turnaround times in busy work situations, reduces health & safety issues and reduces dirt transfer around the clean floor. 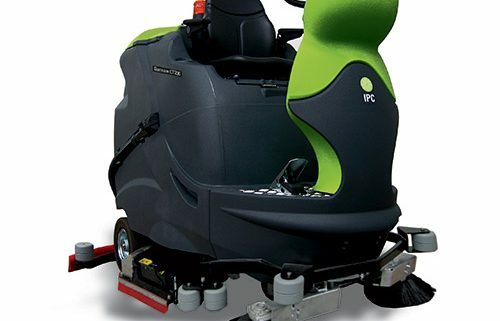 The IPC Gansow 161 ride on sweeper has been designed for cleaning large areas of flooring as quick as possible. With a huge 300 litre front loading waste container you can collect heavier waste than conventional machines and with a working width of 1.6 meters you can clean up to 11,875m²/h. The driver has full control with easy to use settings, rear steering for amazing turning circle and twin front brushes for edge cleaning. The direct throw brush system reduces the distance the waste has to travel so now you can collect even heavy debris so perfect for metal works, packing plants and car park litter. The Self Levelling System (SLS) automatic brush pressure control is fitted as standard to allow constant brush contact on uneven flooring. To prevent airborne dust while sweeping the 161 has a huge 8m²; panel filter to collect all the dust and has an automatic filter shaker to keep it clean. The 161 can also be fitted with dust flaps over the front brushes to further prevent airborne dust and can have various cab options including open cabin, cabin + windscreen and a closed curtain cab. 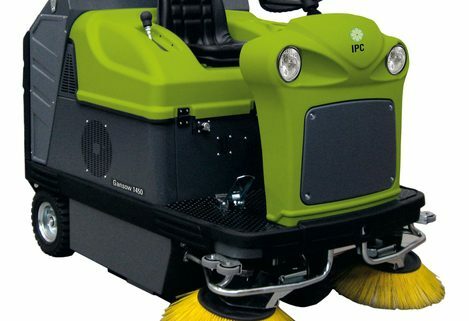 The IPC Gansow CT160 BT75R Sweep ride-on scrubber drier incorporates two machines in one. With self-adjusting side brushes to collect dry debris from kerbs and racking edges the cylindrical scrubbing brushes then separate the dry debris from the wet tank. This system increases time efficiency by removing the pre sweep process normally done before scrubbing. The CT160 BT75R Sweep is the ideal machine for shopping malls, airport terminals and warehousing with light debris for a quick and efficient clean. As with the standard CT160 the control panel is easy to use with 3 pre-set work settings, great all round visibility and huge productivity (4,875m²/h). The operator is able to carry out most machine maintenance as all major parts are easy to access without the use of tools. Squeegee blades are 4 sided for longer working life while the brushes feature the automatic on/off function to enable easy checking of brush wear. If the sweeping function is required the user simply lowers the side brushes, selects the scrub function and two tasks are completed in one.